Last post I hinted at how frustrated I was becoming by my slow progress; however, this week has been an entirely different situation. The major difference between my progress these past two weeks, and last two weeks is my attitude and focus. Being eight weeks into the project, I finally stopped stressing about how slow I was. I’ve accepted that I really can’t work any faster and I’ve got to work with that. After accepting that, I’ve been able to focus better when painting. 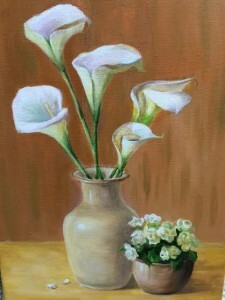 If I can only finish one painting every eight weeks, I have to be content with that because I can’t rush good quality. I have a better attitude and I even feel more inspired at my classes. Without my negative attitude, my two hour art sessions with Grace have been much more productive. I feel creative and excited to start new paintings without stressing myself the whole session. I recently just switched my art classes with Grace from Wednesday’s to Tuesday’s because of my mother’s new job. It’s been relatively the same, but the only problem is that this class has almost double amount of people. On Wednesday lessons, Grace was able to have lots of one on one time with me as there were only five people in that class. On my Tuesday classes, there’s around eleven people who all need Grace’s help. I typically just try to focus on my work and be patient until Grace has time to meet with me. This week I finally finished my first painting! I couldn’t be more excited about the end result. It took me a solid eight weeks, but I finished and it turned out better than I thought. The last two weeks consisted of me finished the small parts on the painting such as the small flower pot on the side, and finishing the large flower pot. 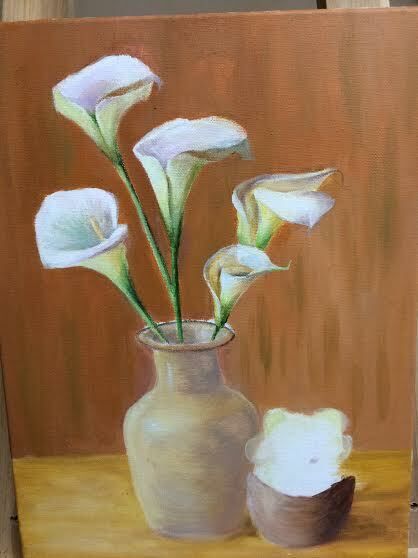 I did a lot of touching up highlighting certain parts of the painting and adding shades and shadows on the bottom of flower petals. Overall, it took longer than expected, but I finished and that’s all that matters. Grace suggested that I stick with similar painting styles and I recently started another painting last week. My recent painting is much more difficult than I expected and I barely made any progress. The hardest thing about this new painting is that there are lots of reflections because of the water in the picture. Grace said that the hardest things to paint are reflections and water so maybe it wasn’t a great idea to pick painting rocks in a river creek. I’m thinking about actually changing that painting into something different next week by just simply painting over the small rocks. As for De Bono, Grace and I have no trouble with any forms of communication or asking questions. 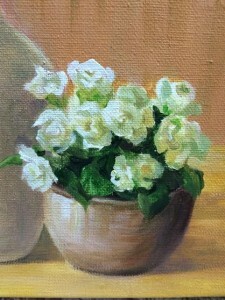 I typically ask Grace about small details in my painting such as what areas needed to be highlighted or darkened. Grace has always been high spirited and helpful with any questions I ask and for that, I truly appreciate. Grace and I always have conversations that flow naturally. I never really have to think hard about what needs to be asked as we can talk about anything for literally half an hour. I’ll ask her a question, she’ll ask me a question back, I’ll ask another question asking for clarification, and etc. I feel like the best conversations are conversations that aren’t forced in any type of way. I should be able to listen to Grace’s suggestions and answer back without being worried about her judging my question or judging me for that matter. Overall, this has been my most successful week in my eyes. I’ve been happy, inspired, and positive about in-depth this week and I can’t wait to start my next painting. For now, enjoy looking at my progress. Wow. It is often in our attitude and ways of viewing what we do that help us progress and enjoy the moments more.